I’ve suffered fits of insomnia since I was young. I’d wake my mother at 2 a.m. to “roast marshmallows” (her paired socks) on “the grill” (her blanket-covered legs) or to tell her stories about multiplication, butterflies, or something else nonsensical. The disruptions in my sleep patterns have led me to read a good amount about the purposes, causes, and effects of sleep including the act of dreaming. John Lehrer’s work tends to contemplate the humanities and the sciences together. In his article for The New York Times, “Why We Need To Dream,” he observes: “I can’t help but be jealous of my wife’s twitching eyelids at 2 a.m. She is busy remembering, processing, refreshing —and I am merely awake.” This sentiment left me wondering: what if we could share our necessary slumber? We can speak of a good night’s sleep, but what if we could hold each other close and literally transfer the benefits of REM from one body to another. 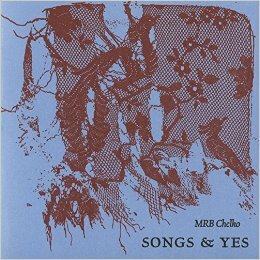 We cannot, but MRB Chelko’s Songs & Yes comes close. Dream motifs run the risk of platitude. Songs & Yes is not about dreams. Rather the construction of each poem feels similar to dreams. In his article, John Lehrer asks, “Why the non-sequiturs, the long forgotten characters and the unexplained state of public undress?” Lehrer could easily ask these same questions of MRB’s poems. The fragmented structure of her poetry is something like our brain-workings during REM sleep. With the dark jars of her eyes the pharmacist disapproves. Silence. No doctor signed this. But look at me. I am dragging the trash bags of my feet up the stairs. The jars empty. Pharmacist. Look up. I am hanging a shirt. The second poem of the collection, which is also available at unsplendid, moves from an undefined “it” to “your parents house,” from “in the blue” to “a ship,” from “crayons of grass” to “somewhere in your body something is leaving a note.” While crayons might be useful in note taking, “crayons of grass” are not literal, and even if they were, they could only figuratively leave a note within a body. Despite being elegantly laced together, the conclusions within Songs & Yes do not logically follow from premises. In order to begin to comprehend these poems, our brains need to engage. We must actively remember, process, and refresh. “While we are fast asleep, the mind is sifting through the helter-skelter of the day, trying to figure out what we need to remember and what we can afford to forget,” writes Lehrer on dreams. Sound familiar? This is not unlike MRB’s poetry. Well get on going. Get sitting there for a while wondering about your life here. About kisses you once shared with a pair of soapstone lips. Was she real? Yes. Will she return? No. Someone like her? No. The collection also holds what Lehrer describes as “the unexplained state of public undress,” which eloquently refers to the finding of oneself naked in public, in his “Why We Need To Dream.” Within Songs & Yes, we witness “glittering white bodies” and, more figuratively, private laughter, lost identification, tragic accidents, and other soul-bearing circumstances. There’s not much I cherish more than a good night’s sleep, and MRB’s Songs & Yes does seem to replicate our precious REM. Once upon a time I spent my sleepless childhood nights rearranging dozens of plush toys into midnight parades. The implausible participants ran from bookshelf to bed and back to bookshelf again. These nights, I’ve been connecting the intangible yet palpable dots within MRB’s luminous Songs & Yes. Heather Lang is the Associate Poetry Editor and Managing Online Editor of The Literary Review.